​Trim your Crape Myrtles like a pro. Don't make these 4 mistakes. You might be wondering.. How should I prune my Crape Myrtles like the pros do. No worries, this is a common question we get and by the end of this article you'll understand how to prune your crepe myrtle trees without making the same mistakes you've seen your neighbors make. Now the good news is that Crape Myrtles are one darn tough plant. So the bottom line is if you make a mistake most likely your tree will recover in a few seasons. 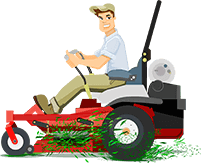 Most professional lawn care services and homeowners who know what they are doing will prune these off. Now with that being said , if you want your Crape Myrtle to have a more "natural" look or would maybe would even prefer for it to grow multiple trunks, then the good news is you can leave some of the suckers to grow up. The best part? Blooms will appear on new growth suckers. Now…these are your Crape Myrtle’s… So it's up to you how you would like for them to look. But it helps to identify which pruning style meets your ideal look, so keep reading to find out more about the three main pruning styles. Crape Myrtles are one of the most resilient and prune-able plants I have ever seen. So its really just a matter of your preference how much time and effort you are willing to invest into heir pruning and care. There's really no "wrong" way to do it, so experiment and have fun! Meanwhile… I'll leave you with a helpful how to video on pruning your Crape Myrtles.